With the shortening days my thoughts turn naturally to layers and wool and knitting and the need to make something to keep myself warm. So I'm putting away all the cotton pieces that I didn't get to this summer. They will have another chance next year. But this weekend is still warm and I am happy that I finished another sleeveless top. 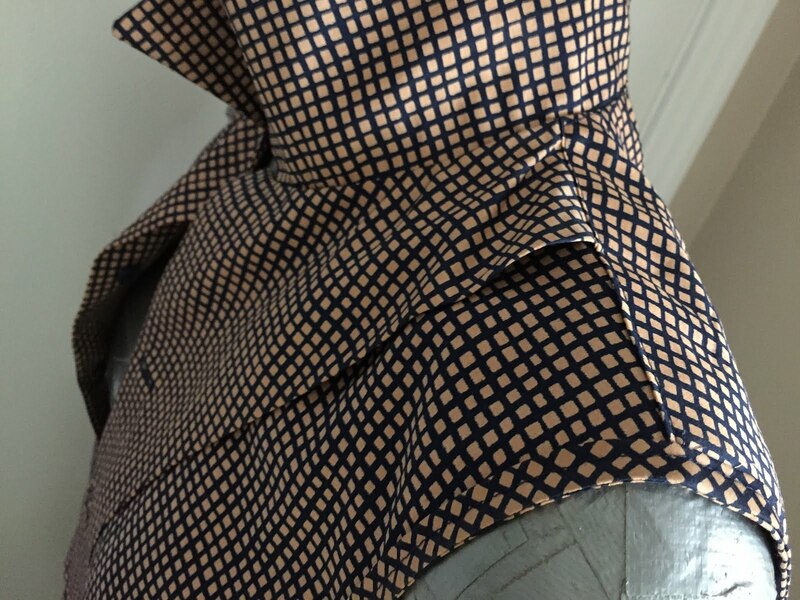 This project started life as a huge man's housecoat. Yes, I am serious! I only wish I had taken a photo but I didn't think of it until it was too late. Thrifted, it was only purchased because it was made of an extremely high quality 100% cotton sateen. 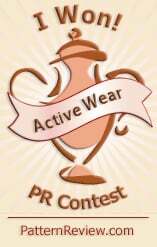 The original label is Holt Renfrew. Someone paid a nice amount for that robe. But it wasn't me. You would think I would have enough to make a garment at least as big. But that isn't how it works. Once I picked off the 4 pockets (all double topstitched with tiny stitches) and realized that it had two-piece sleeves I had enough to comfortably make this sleeveless shirt, including the cut-on front facings, a double yoke in back and bias strips to finish the arm openings. Look Ma! No raw edges! At right is a photo of the inside, which I am rather proud of. I even remembered to sew the fusible interfacing to the front facing at the outside edge before fusing. Such a nice finish! My pattern choice is quirky. 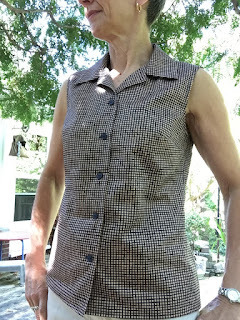 I have a vintage pattern for a sleeveless shirt with a convertible collar, which I rejected. I've made it twice (second effort blogged here). I rejected it because I wanted a slightly less blousey and more modern fit. Specifically, it had too much fabric in the upper chest and shoulder area and was too nipped in at the waist. 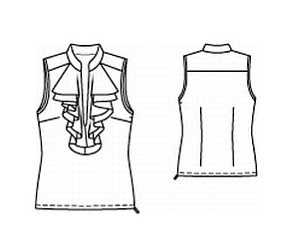 I had a blouse with just the fit I wanted in my closet, but the original pattern (line drawing at left) was totally wrong in all the details. It had a stand collar, ruffled front and no front opening for starters. And I wasn't sure how the yoke would work with a convertible collar style. 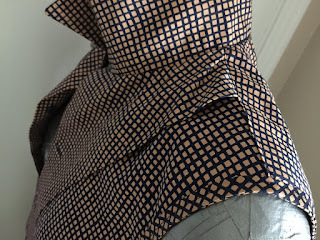 This time I also added an overlap and cut-on front facing for a front button closure, extended the front to the top of the shoulder, reduced the back yoke accordingly, and added a convertible collar. 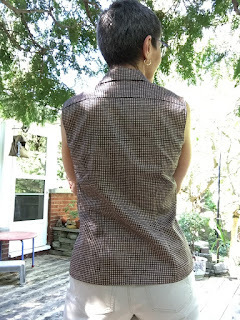 I did not completely eliminate the back yoke (even though its existence made for a bit of a sewing puzzle moment when trying to clean finish the inside neckline) because it builds in some very nice back shaping. The new collar was a bit of a leap in the dark that had me comparing the shoulder and neck shapes of my vintage Simplicity pattern with the modified Burda one (they were amazingly and completely different and my seeming inability to understand how that can be is a little bit terrifying) and puzzling over my pattern drafting books. I decided to just give up and wing it, cut a mock up out of scrap fabric and pinned it in, finding that it was exactly right. I guess I shouldn't overthink these things.